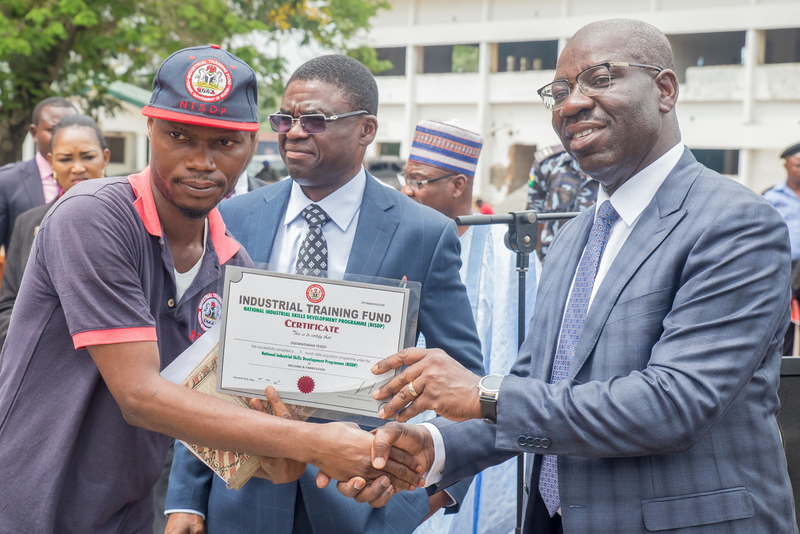 The Edo State Government in collaboration with the Industrial Training Fund (ITF) on Wednesday, handed starter-packs to 467 people who participated in the second phase of the National Industrial Skills Development Programme (NISDP). Speaking at the closing ceremony at the Government House in Benin City, Governor of Edo State, Mr. Godwin Obaseki, commended the ITF for collaborating with the state government in its resolve to create 200,000 jobs in the state. “We want to change the narrative that vocational jobs are inferior to white-collar jobs. We must create small and medium scale enterprises for our nation to develop because it is the most viable way to create jobs,” he said. The governor urged the beneficiaries of the training to put into efficient use the starter- packs by setting up their own small-scale businesses as the state government will provide working capital for them. He, however, warned the beneficiaries, who were drawn from the 18 local government areas of the state, not to sell the starter-packs as the progress of their businesses would be monitored. The starter-packs given to the trainees included 150 sewing machines, 142 ovens and gas cylinders, 50 welding machines and 125 complete computer sets. In his address at the event, the Director General of ITF, Sir Joseph Ari, said the initiative to equip youths with skills is in line with the vision of President Muhammadu Buhari, to ensure sustainable development in the country. Ari commended the state governor for ensuring each trainee got starter-packs and added that it would go a long way in helping them unleash their inherent talent. The DG hailed Obaseki for investing in vocational education, noting that his agency was ready to train more manpower at the Benin Science and Technical College. The participants were trained in fashion designing, pastry making, welding and fabrication and Information and Communication Technology (ICT) for about three months.